CDTech is excited to launch the Non-Profit Management Academy at Los Angeles Trade Technical College this fall! The Non-Profit Management Academy is a series of project-based Community Planning (CP) courses designed to provide professional development for individuals looking to enter the Non-Profit sector or professionals seeking to expand their current skill-sets. Each course will dig deep into current community issues and be taught by professionals who are currently leading projects throughout Los Angeles. The Non-Profit Management Academy cohort of 2018 will learn how to Manage Non-Profit and Public Organizations from Vanessa Vela-Lovelace, whose leadership has shaped a variety of organizations and programs. Vanessa Vela Lovelace has 20 years of experience working in non-profit organizations focused on developing leaders who build strong and inclusive communities. She formerly served as Director of Programs for CDTech; overseeing Americorps programs like Public Allies Los Angeles and Serviceworks Los Angeles; Director of the Community Planning Program at Los Angeles Trade Technical College; and various initiatives focused on South Los Angeles, community economic development, building the capacity of emerging nontraditional leaders and resident led solution making. Vanessa is an LA nonprofit professional whose own leadership development began as a high school student representative to the LAUSD Commission on Women and with human relations facilitation with national human relations organization NCCJ. Vanessa’s groundwork training also included participation in seminal Los Angeles leadership programs Summer Activist Training and the Summer Program for Enrichment and Learning. Vanessa was also a core member of the Balagtasan Collective, a Filipino American group of artists and activists who created and presented art for social change.Vanessa has volunteered with organizations that served the Historic Filipinotown neighborhood. 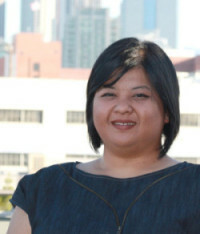 Vanessa joined community arts organization FilAmARTS, producers of the Festival of Philippine Arts and Culture as a volunteer in 1999, where for 14 years, scaled up in responsibility in the organization, serving as Administrative Director during FilAmARTS’ peak years, and ultimately as Board Chair until 2014. Vanessa consults on a range of issues such as strategic planning, Board development, evaluation, organizational restructuring, program planning, management, training and facilitation, policy analysis, advocacy, human relations facilitation and community organizing. She holds a Master’s in Public Administration with a certificate in Public Policy from the Sol Price School at USC. Vanessa most recently served as Program Officer at the Weingart Foundation. As a mother and community advocate, Vanessa’s drive for the work is belief in the power of arts and culture in building the kind of community that nurtures and grows strong young people. Vanessa believes that anyone can learn, understand, engage and change the conditions that affect them. She works to restore and uplift the dignity that all people deserve. The Managing Non-Profit and Public Organizations (CP 6) will meet every Wednesday from 6:00 PM – 9:10 PM beginning August 27th through December 16th. This course will dive into the organizational opportunities and challenges faced by directors and managers of non-profit and public service organizations. Students will learn the skills and knowledge to effectively manage and function within non-profit organizations. Those interested in participating in any of the courses offered as part of the Non-Profit Management Academy may enroll through the LATTC student enrollment page. Courses are $46 per unit and financial aid is available. A full schedule and info packet can be downloaded here.